For Quinn Hoffman, baseball is the family business. The son and nephew of MLB players, Quinn Hoffman ’20 has played the game for as long as he can remember. 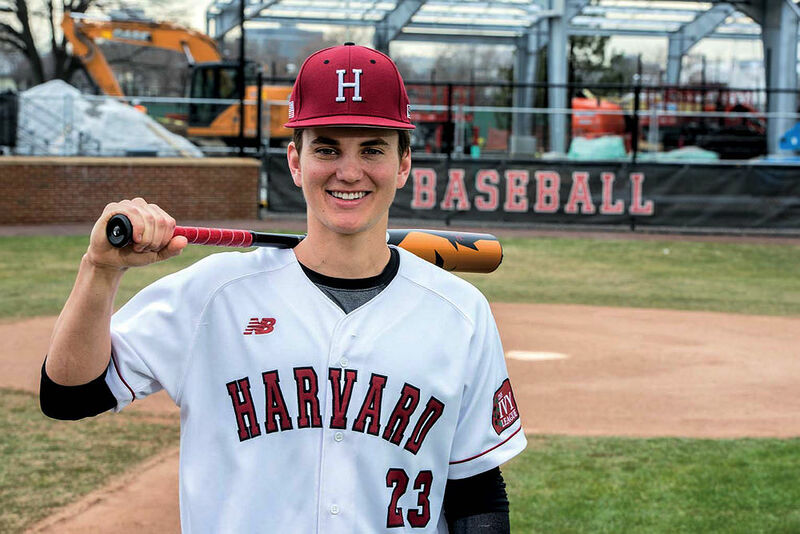 Quinn Hoffman, a Harvard freshman on a 13-game hitting streak, stepped up to home plate at Fenway Park. Batting second in the 2017 Beanpot baseball championship against Boston College, he looked out at the pitcher’s mound, where his father, Trevor Hoffman, had pitched in the 1999 All-Star Game. Beyond the mound, the shortshop was standing where his uncle, Glenn, had played with the Red Sox from 1980 to 1987. Now, with the first pitch, it was his turn. “I was just able to get a good pitch, and put a good swing on it,” he recalls, “and I didn’t realize I was going to be able to hit it out.” The ball shot off Hoffman’s bat, over left field, toward Fenway’s Green Monster—and cleared the 37-foot wall for his first college home run. Hoffman had a 14-game hitting streak last year, culminating in a home run at the Beanpot final. Even as a kid, Hoffman knew he wanted to play his uncle’s old position. “I’ve always wanted to be a shortstop,” he says. “I kept playing infield, enjoyed it, being able to get my uniform dirty and dive.” He watched his dad’s teammates play short and second base, soaking up their mechanics, their footwork, their arm action, how they turned double plays. Meanwhile, he watched his father—a bullpen leader famous for entering games in late innings to AC/DC’s “Hells Bells”—lead by example with his work ethic. “[He’d be] showing guys, ‘Hey, we’re getting up early, going to work out, going to run,” he recalls. Trevor Hoffman pitched for the Padres from 1993 to 2008, then ended his career with two seasons in Milwaukee. His older brother, Glenn, has been the Padres’ third base coach since 2006. While in high school, Quinn spent a couple of weekends a year with his uncle at the Padres’ spring training in Peoria, Arizona, shagging fly balls during batting practice and taking part in infield drills. “He gave me a couple tips here and there: try to stay underneath the ball, be quick with your feet, let your hands do the work,” Hoffman recalls. Meanwhile, he’s been recovering from off-season shoulder surgery, undergoing twice-weekly physical therapy. As of press time, he was hoping to return to the Crimson lineup sometime this spring. When he does, he’ll likely become the starting shortstop. “As soon as he’s healthy, we become a better ball club,” says Decker.